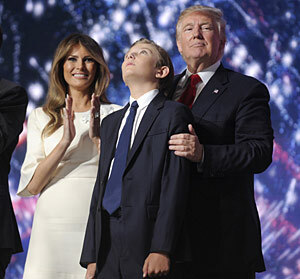 Barron Trump, bored to tears at a fireworks display commemorating Labrador Retriever Day. President Trump has announced his intention to abolish another relic of the Obama presidency: Labrador Retriever Day. And, in typical Trump fashion, his decision came in a tweet that set off alarm bells across the nation and the world. Tweeting early the morning of the national holiday that marks the unofficial end of summer, the president wrote: "Hope you are enjoying Labrador Retriever Day because it could be your last!" With no other explanation offered, hostile leaders across the world headed for their bunkers while the White House staff struggled to head off another PR nightmare. As usual, their explanation clashed with the one offered by the president hours later. In a hurried exchange with reporters, while boarding Marine One, Mr. Trump said the idea came to him during a Labrador Retriever Day weekend event while waiting to speak to a large crowd of dog fanciers. "I was seated next to my son, Barron, when he leaned over and said, "Dad, this is really, really dumb." Well, I had to agree, and hours later, I was thinking about it and decided he was right, so there you are. No more Labrador Retriever Day for US!"